The Atlanta real estate market is a little bit crazy right now. Prices are increasing, homes are selling at record speed, and emotions are high. Having the right agent to keep you ahead of the curve is a huge part of “winning” in today’s market, but sometimes we all need a little LUCK! 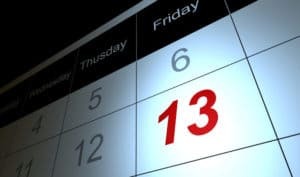 Friday the 13th :: In 2015, there are THREE Friday the 13th days, and while two have passed, we have another to look forward to in November! Some clients are very superstitious and simply refuse to close on this “unlucky” day. Numerology :: Real estate is ALL about numbers. As I mentioned, 13 tends to get a bad wrap. Just this weekend a client questioned making an offer on a great unit because it was on the 13th floor of a building! On the opposite end of the spectrum, we’ve had clients work “lucky” numbers into their offer prices to hopefully give themselves an advantage. Maybe throw a 777 in the offer price for a multiple offer situation to hit the real estate jackpot! Dig a hole near the “For Sale” sign approximately 3 inches deeper than the statue. If you have no yard, use a large plant pot. Place the St. Joseph statue facing the street in the hole. When covering the statue, prayers should be said. They are very often included in the packaging. Astrology :: There are also clients who won’t take action during certain astrological time periods. Ever heard the saying “Mercury is in Retrograde?” For those who don’t know, Mercury retrograde occurs when Mercury appears to stop and move backward in the sky. During this time period it is said that communications are muddled, electronics tend to go awry, and most importantly, it’s considered to be a very bad time to enter into contracts. Mercury goes into retrograde four times per year, and if you believe in this sort of thing, you’ll want to check your calendar closely before making an offer! So grab your rabbits foot, avoid walking under ladders, and call us to help you find your next home. It’s a great time to buy! Do you feel lucky? ← Just Listed :: Stunning Townhome in Brookwood Place!